We Americans often think that bruschetta is the mixture of tomatoes, garlic, and basil on a slice of toasted bread. Bruschetta, from the Italian word bruscare, meaning to toast or burn, actually refers to the thick slices of grilled bread. Often served as a snack or appetizer, bruschetta is traditionally prepared by rubbing the bread with garlic and drizzling it with olive oil before toasting it over hot coals. Then the bread is topped with a simple mixture of tomatoes and fresh herbs. It is an easy way to showcase the excellent quality of freshly-pressed olive oil as well as a way to preserve bread that is beginning to get stale. This version veers away from the simple, traditional bruschetta. First off, goat cheese is spread on the toasted bread. Then,the bruschetta is topped with a mixture of sautéed mushrooms, bacon, and sun-dried tomatoes packed in olive oil, leftovers from the pesto pizza I had made last week. The tangy goat cheese complements the topping very well. There is only a hint of garlic on the grilled bread and topping so it isn’t overpowering and the red pepper flakes it a little heat. It’s an easy-to-prepare, yet elegant appetizer that is delicious served the same day, but even better re-heated the next day. Rub slices of bread with the whole garlic clove and then brush with olive oil. Toast in the oven until slightly crisp and light golden brown, about 5 to 7 minutes. Cook the bacon in a heavy-bottomed skillet over medium-high heat. Remove from pan and drain on a paper towel. Pour out all but 2 tablespoons of the bacon fat. Reduce heat to medium and add butter to the skillet. Sauté the garlic and shallots for 1 minute. Add the mushrooms, sun-dried tomatoes, and thyme and cook for about 5 minutes, until mushrooms and tomatoes have browned and softened. Deglaze with cognac, scraping the flavorful brown bits off the pan, and cook down until the liquid is reduced. Season with red pepper flakes, salt, and pepper. Remove thyme stems. 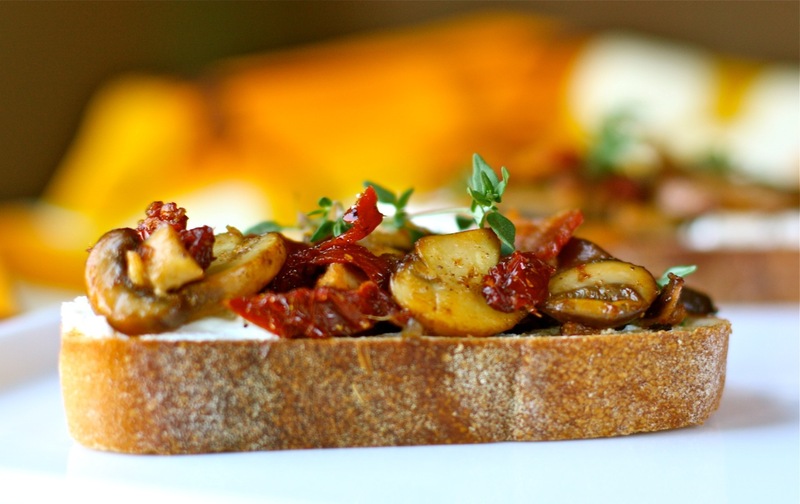 To assemble, spread bread slices with goat cheese and top with mushroom/sun-dried tomatoes mixture. Sprinkle with reserved thyme leaves. Adapted from Blue Jean Gourmet. Presumably somewhere along the way the cooked bacon gets mixed back in with the mushroom and tomato mixture. Did you use tweezers to set your mushrooms so perfectly on the bread? That is an absolutely perfect picture. Thanks for visiting my blog, Shannon! Also, thanks for the tweet. I have been making a bruschetta with roasted red peppers, olives and goat cheese on a pesto base. This one looks so good too! I have to give it a try! Thanks for the great idea! Your bruschetta sounds delicious, as well. I have some pesto right now, so I could try it. Thanks for sharing. Thanks, Barbara! I’m a sucker for bacon as well. Oh, yum. 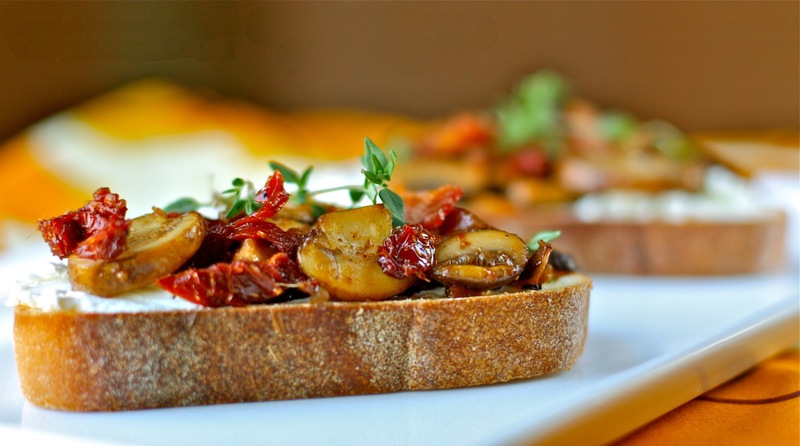 Mushrooms and goat cheese–how can you go wrong? Fabulous! Love the combination…I adore sun dried tomatoes, there is a deep flavour that you can’t get from normal ones! Great idea! Superb. The goat cheese is a nice variant. I will need to try it.